Porter Wright is pleased to welcome Susan K. Cliffel as a partner in the firm’s Cincinnati office. Cliffel is a member of the firm’s Corporate Department, focusing her practice on bankruptcy, creditors’ rights and equipment financing. She advises and represents financial institutions in a broad range of litigation and transactional matters; including equipment leasing as well as issues involving the United States Bankruptcy Code and the Uniform Commerical Code (UCC). 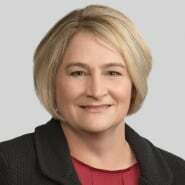 She also advises companies in the construction industry on mechanics’ liens and litigation matters. “We are delighted to welcome Sue into the firm. She is a talented lawyer and a highly respected member of Cincinnati’s legal community,” said David Croall, partner in charge of Porter Wright’s Cincinnati office. Prior to joining Porter Wright, Cliffel practiced at a mid-sized Cincinnati law firm where she represented financial institutions and companies in the construction and building materials industries. She is admitted to practice in Ohio, and the U.S. District Court for the Southern and Northern Districts of Ohio as well as the Sixth Circuit Court of Appeals. She earned her J.D. from The Ohio State University Moritz College of Law and her B.A. from Cornell University.